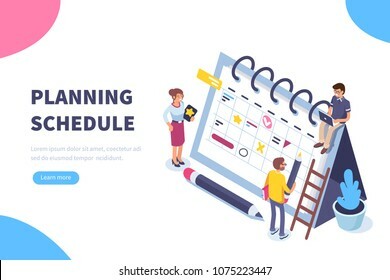 8147 place | Vector illustration in rank M-rank: Planning schedule concept banner with characters. Can use for web banner, infographics, hero images. Flat isometric vector illustration isolated on white background. Planning schedule concept banner with characters. Can use for web banner, infographics, hero images. Flat isometric vector illustration isolated on white background.